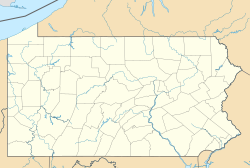 For other Pennsylvania townships with similar names, see Milford Township, Pennsylvania (disambiguation). Milford Township is a township in Bucks County, Pennsylvania, United States. The population was 9,902 at the 2010 census. It is home to the Quakertown interchange of the Northeast Extension of the Pennsylvania Turnpike (Interstate 476). According to the United States Census Bureau, the township has a total area of 28.1 square miles (72.8 km²), of which, 28.1 square miles (72.7 km²) of it is land and 0.04 square miles (0.1 km²) of it (0.11%) is water. Milford Township is in the Delaware watershed and most of it is drained by the Unami Creek and Macoby Creek into the Perkiomen Creek and Schuylkill River, but an area in the eastern portion is drained eastward by the Tohickon Creek. Other natural features include Butter Creek, Hazelback Creek, Kuglers Roost, Licking Creek, Morgan Run, and Schmoutz Creek. In Milford Township, Interstate 476 has its Quakertown Interchange with Route 663, which connects Quakertown to the east with Pennsburg and Pottstown. A local north-to-south thoroughfare is Allentown Road, which extends south from Coopersburg into Montgomery County. Other local roads of note include Geryville Pike, Krammes Road/Spinnerstown Road, Kumry Road, Old Bethlehem Pike, Sleepy Hollow Road/Steinburg Road, and Trumbauersville Road. The township's villages include Brick Tavern, Cressman, Finland, Geryville (also in Montgomery County and pronounced with a hard "g"), Kumry, Milford Square, Mumbauersville, Rosedale, Sleepy Hollow, Spinnerstown, and Steinsburg. The borough of Trumbauersville is surrounded by Milford Township. As of the 2010 census, the township was 94.1% White, 1.5% Black or African American, 0.1% Native American, 1.4% Asian, and 1.3% were two or more races. 1.8% of the population were of Hispanic or Latino ancestry. As of the census of 2000, there were 8,810 people, 3,073 households, and 2,449 families residing in the township. The population density was 314.0 people per square mile (121.2/km²). There were 3,161 housing units at an average density of 112.7/sq mi (43.5/km²). The racial makeup of the township was 97.75% White, 0.69% African American, 0.09% Native American, 0.65% Asian, 0.01% Pacific Islander, 0.32% from other races, and 0.49% from two or more races. Hispanic or Latino of any race were 1.02% of the population. There were 3,073 households, out of which 36.9% had children under the age of 18 living with them, 71.0% were married couples living together, 5.3% had a female householder with no husband present, and 20.3% were non-families. 15.9% of all households were made up of individuals, and 5.1% had someone living alone who was 65 years of age or older. The average household size was 2.80 and the average family size was 3.16. In the township the population was spread out, with 26.2% under the age of 18, 6.1% from 18 to 24, 31.4% from 25 to 44, 24.9% from 45 to 64, and 11.3% who were 65 years of age or older. The median age was 38 years. For every 100 females there were 99.1 males. For every 100 females age 18 and over, there were 96.2 males. The median income for a household in the township was $59,683, and the median income for a family was $64,563. Males had a median income of $41,132 versus $30,773 for females. The per capita income for the township was $23,559. About 2.1% of families and 2.9% of the population were below the poverty line, including 3.6% of those under age 18 and 0.8% of those age 65 or over. MIlford township is patrolled by the Pennsylvania State Police, Dublin Barracks. During the summer months, frequent episodes of high humidity occur. Occasionally, heat index values exceed 100°F (38°C). On average, the wettest month of the year is July which corresponds with the annual peak for thunderstorm activity. During the winter months, wind chill values occasionally fall below 0°F (-18°C). On average, the snowiest month of the year is February which corresponds with the annual peak for nor'easter activity. Milford Township has a hot-summer humid continental climate (Dfa) and is in hardiness zone 6b. Climate data for Milford Township, Pennsylvania (1981 – 2010 averages). Elevation 519 ft (158 m). ^ "Census 2010: Pennsylvania". Usatoday.Com. Retrieved 2013-07-22. Wikimedia Commons has media related to Milford Township, Bucks County, Pennsylvania.